Land degradation takes many forms, including the various types of water erosion. 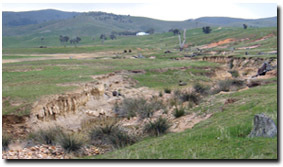 The aim of this section is to present specific case studies on various aspects of land degradation in Victoria. The information from these studies is explained in such a way that it can be applied to various environmental processes, such as water movement in response to rainfall. (including dryland salinity, gully erosion, tunnel erosion and sheet erosion).